We haven’t focussed much on local government so far in this campaign, because it has to be said that many local councils do pretty good work in terms of making data available – possibly because they’ve often, in the past, been required to do so. Planning applications, for example, are generally available on the web. The problem is finding out whether one in your area will affect you, because if it’s a few streets away you might care about it, but won’t receive a letter telling you about it. Which drove Richard Pope to write Planningalerts.com (note you need the “www”, as in the link; the http://planningalerts.com site is just a placeholder). It took him five days over Christmmas, but he reckons the template – which uses a screen scraper – can be applied very widely. So although he’s only got 41 or so councils hooked up, the other 300 or so should be quite easy to add, because there are a limited number of software packages used by councils to put planning data online. Pope’s idea: you put in your postcode and email, and the site will contact you when something is applied for in your area. Simple? Yes (by computing standards). Clever? We think so. Could be done by government? Well, it sort of is – except at much more expense, and put into the hands of a commercial company (Emap) which says it retains the copyright on the data it offers through the National Planning Application Register. In Don’t panic: we’ll email if someone plans to demolish your house, today’s Guardian Technology explains what Pope would like (an API/XML feed from councils that would obviate the need for screen-scraping). The irony is that government already offers a similar service to search for planning applications through its national planning portal at planningportal.gov.uk. But rather than five days, it has taken a year to build; it doesn’t send out proactive alerts; and a formidable copyright notice says that the National Planning Application Register is copyright of a commercial company, Emap Glenigan (whose website is used for the searches). We’ve got nothing against Emap Glenigan using the same data that’s widely available – but it’s everyone’s, not Emap’s. Is the new Statistics Board the right model for free data? In this week’s Guardian Technology, Michael Cross examines what the proposed changes to the structure and oversight for the Office for National Statistics means for data access. national statistics are an important example of public sector information being posted free on the web. We would like to see all impersonal data collected by government to be made available this way, for the benefit both of democracy and the knowledge economy. Second, the governance regime now before Parliament could be applied to other types of data, from maps to weather forecasts. In the field I work in housing (asset management) the use of maps would be particularly beneficial. On top of this, I also help manage some patch related data for our housing management team. Being able to link all this into some automapping system would make many tasks I perform so much easier. In addition, visual tools are staggeringly useful when persuading people or explaining things to a new audience. Being able to show a map which outlined that 80% of our Decent Homes failures are in one half of our stock would be a lot more powerful when persuading our board to release extra funds, for instance. The human mind responds strongly to visual stimuli, and maps in particular plug straight into a particular part of the brain. Of course, to do all this, we need a certain amount of geographical data. There’s the maps themselves and then there’s geocoding our properties. Which leads to enquiries like the above. No doubt we could afford that, but in good conscience can we really spend £16k on what is effectively a glorified A to Z? £16k after all could supply brand new kitchens to four families, or ensure 8 homes have brand new central heating systems which will cut fuel bills and keep people warm should the weather change. We have to consider the opportunity costs. As the post title says, this isn’t the ‘tragedy of the commons’ (where making something free means it gets abused, as in email carriage and spam). It’s the opposite: by enclosing the land, you keep out precisely the people who could make the best use of it. It’s like having farmland and then charging anyone who’s a farmer or wants to learn thousands of pounds to work it. And so what will we do? As is often the case, my answer is DIY : We’ll collect the data ourselves. As ridiculous as it sounds, because of the restrictions on the data we’ll be much better off simply collecting the information ourselves and using any one of a number of open source applications simply generate the maps ourselves. Or so is my intention. GPS equipment is now within the reach of the average citizen and a procedure for geocoding our properties could easily be included within our stock condition procedure or even included in with caretaker duties or a void routine. But…isn’t this a bit ridiculous? Aren’t we going against a sensible division of labour? Instead of information being collected by experts en masse, we’re going to be taking a piecemeal amateur approach. Yes, that’s how creating an ‘internal market’ generates inefficiencies. The council’s data might not be as good as the OS’s, and you’ll have duplicated work. Stupid. A member sought clarification from the Chair on whether APPSI intends writing to the Guardian in response to its “Free Our Data” campaign. The Chair stated that there were no plans to do so. He indicated said that the Guardian articles were providing a useful debate on issues relating to public sector information. The articles have been written by different contributors setting out their own viewpoints. APPSI did not consider it appropriate to get involved in commenting on specific issues or when an article contained some inaccuracies. The APPSI minutes contain some interesting points, including that of whether PhDs are subject to copyright, and if so whose. Mike Clark stated that his paper “Fee or Free”, which is to be published in Business Information Review, was written in a personal capacity and it would contain a disclaimer stating that it did not represent the views of Government or APPSI. This led on to a discussion about the accuracy of the figures used to compare the EU and US PSI markets that were included in the PIRA Report on PSI for the EC in 2000. If the figure for the size of the US PSI market is incorrect it could have a significant bearing on the arguments that have been used to comment on the UK government’s approach to PSI and on other studies that use the figures cited by PIRA. A member suggested that APPSI should consider publishing a bibliography created by Mike Clark on its website with useful PSI references. Another member suggested that the bibliography could be linked to the actual articles. Certainly if the numbers from the PIRA study aren’t right, it could have a big effect on the arguments. But it might do those in either direction. Rosling has a very interesting interactive system at gapminder.org where you can plot all sorts of UN data for various countries against each other – such as carbon dioxide emissions vs gross national income, or child mortality against internet connectivity (is there a link? The data should show it). There’s also his enormously impressive TED talk – watch this, and then you might start to see the point of free data, if you haven’t already. In Copyright fight sinks virtual planning, Michael Cross points out how the Virtual London project can only put clips on YouTube and small examples on its blog, because it is barred from putting the whole project online – which would let any of us zoom through a virtual London, and see how the Olympics projects might look, or model flooding, or planning or any of a host of truly useful activities – by, yes, the licensing restrictions imposed by Ordnance Survey. 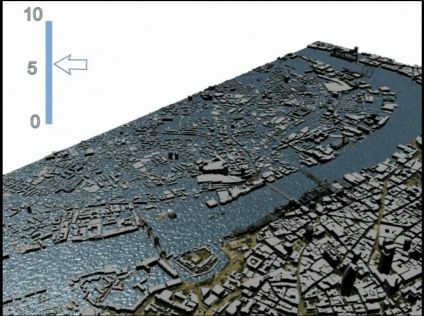 That’s because the model lays the OS’s Mastermap (with details of all buildings and heights in the UK) over a Google Maps system. For London, it’s very impressive – see the Casa blog. Is this, strictly, OS’s fault? Not really – it’s the fault of a government attitude which insists that every bit of data must be sweated as an asset; OS must cut its cloth to fit that insistence. The real obstacle is crown copyright. For data gathered with taxpayers’ help, and by organisations answerable to the government, crown copyright makes less and less sense in a world where the free movement of data enables more activity. You are currently browsing the Free Our Data: the blog weblog archives for January, 2007.